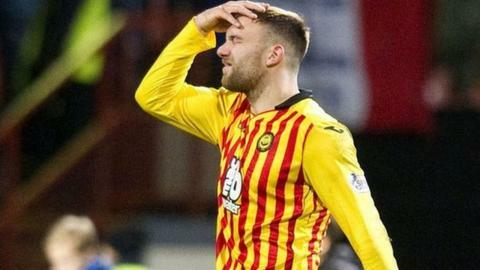 Partick Thistle manager Alan Archibald admitted his side were hurting after a late own goal from Conrad Balatoni earned Dundee a 1-1 draw at Firhill. James Craigen's second goal of the season had earlier given Thistle the lead. "We did enough in the game to win it," Archibald told BBC Scotland. "Disappointing with the goal at the end - I know it's a deflection but it's a sore one. "I was quite happy with the shape of the team. We looked quite resolute, we didn't look like losing a goal. "I thought after the goal we could control things. Dundee threw everything at us, and we looked okay. I didn't see the goal coming. "It feels like two points dropped. It was a chance to go above the two teams ahead of us, and it's a sore one to take because we're at home." Dundee manager Paul Hartley paid tribute to his players for their never-say-die attitude. "I'm happy with the result because going into the dying minutes you're a goal down, credit to the players for never giving up," he said. "The performance can be better, I didn't think it was a great game of football. "We didn't create enough, we didn't work the ball well enough, and the intensity wasn't what it should be. "Overall we'll take a point and we jump up a place which is good. "One thing I'll say about the players; they keep going, they never give up, and they went right to the end which is fantastic to see."